"As a young girl in her native Antwerp she was raped by one of her mothers lovers. Later, during the last war(WW2) she committed the unforgivable sin of falling in love with one of the enemy... She was taken by the local resistance brigade and put in the Lion's cage in Antwerp zoo...Today she lives alone." WILLIAM ROCK, THE SUNDAY PRESS. "The other true story in the novel is that of Joe Porter - an exroadinary story, weaving them together, bringing Porter closer and closer to "Lisette" in Antwerp. Joe's childhood has been traumatic. He had been abandoned by his mother...Joe was a streetfighter, perfectly fashioned for what he was into. He marauded behind enemy lines - he took whatever he could from the dead and anyone who got in his way...."
"He (Karl Muller) took me to a church and he said: "God is not an Aryan, we can marry ourselves. Oh God if I have to die in this war send her a good man - I don't want her to spend her life alone..." The White Brigade said I was collaborating and I was put in the lions cage in the zoo...Then they wanted to shave my head and put swastikas on my breasts, I said: "Come in...if you cut my hair that will grow again, but if I take your eyes out - they won't grow again." I had very long fingernails..."
Live Interview with Lisette. WOMANS HOUR, BBC RADIO 4. 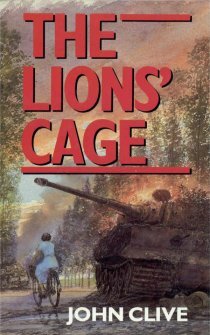 "An extoadinary meeting in Ireland led to John Clive's new book "The Lions Cage"...Compelling and gripping, can't fail to be a success..."
"Joe Porter, a scavenger hunting behind enemy lines...the story twists and turns...would make a very good movie."